This richly fruity cake a delight that may be enjoyed at any time of the day! Mileeven has developed with our teams and exclusively for Le Comptoir Irlandais, this traditional fruit cake, mellow and rich in raisins, cherries and almonds. Enjoy this delicious Irish cake with your friends and family! Awards that the company has been regularly receiving attest of their products’ quality. By tradition, each family had its own fruit cake recipe that was transmitted from generation to generation. 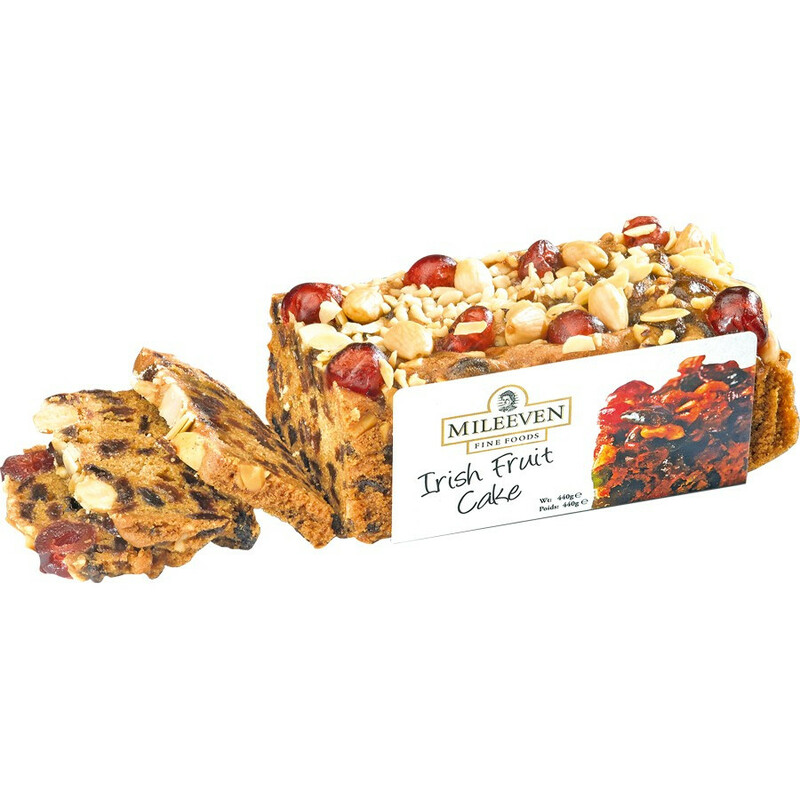 Mileeven, with its generous fruit and butter cakes offers the quality and taste inherited from these traditional recipes. The company’s range of jams and marmalades offers fruity flavours that blend perfectly with authentic Irish products. Ingredients: sultanas (40%), fortified wheat flour (wheat flour, calcium carbonate, iron, niacin B3, thiamin B1), sugar, whole egg, vegetable oil (rapeseed), natural cherries (cherry, glucose, syrup, sugar, colours: anthocyanins, carrot concentrate, blackcurrant concentrate, acidity corrector: (citric acid), preservatives (sulphur dioxide, potassium sorbate, salt), chopped nuts (peanut, walnut, almonds), glaze, salt, mixed spice, raising agent: disodium diphosphate, sodium hydrogen carbonate. Warning and allergen information: for allergens including gluten, please see ingredients in bold. May contain soya and milk traces. Warning: although every effort has been taken to remove stones and fruit stalks, some fragments may remain. Store in a cool, dry place. Once opened store in an airtight container and consume within three (3) days. Best before: printed on cellophane.